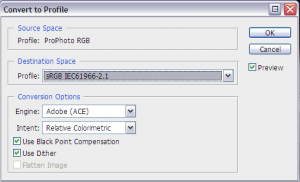 It is strongly recommended that you convert all of your original files to an sRGB color space. Although rare, whether they be EPS or raster images, there are circumstances where CMYK files or files with non-standard color profiles can experience minor hue alterations during the thumbnailing process. As Symbiostock is limited by Imagick which cannot replicate the power of Photoshop, it is recommended that you allow Photoshop to perform the conversion for you. As all JPEG images displayed on the web are standardized to sRGB, the software that performs this conversion is up to you: desktop publishing software, or the web-based Imagick. The current profile is the ‘Source Space’. Click okay after choosing an sRGB profile, and your conversion is complete. This is a recommended process both inside and out of Symbiostock. Unless your file is going directly to print, in which case you would need to synchronize your end result anyway, it is recommended you save all your files in sRGB format for web display. 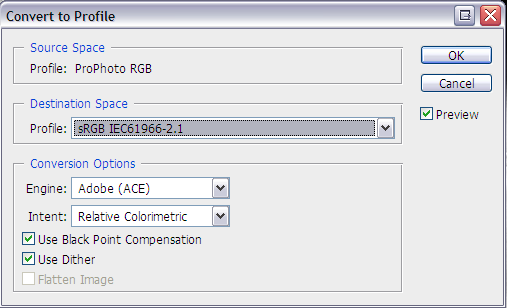 You can make sRGB the default RGB color profile by going to Edit > Color Settings and under Color Management Policies, have the RGB say ‘Convert to working RGB’. If you do experience color fluctuations with the thumbnailing process, you can enable advanced color profile conversions within your Symbiostock > Settings page. This may not work on some servers due to the specific version and method of your Imagick install, and is only recommended in the case of severe color changes.